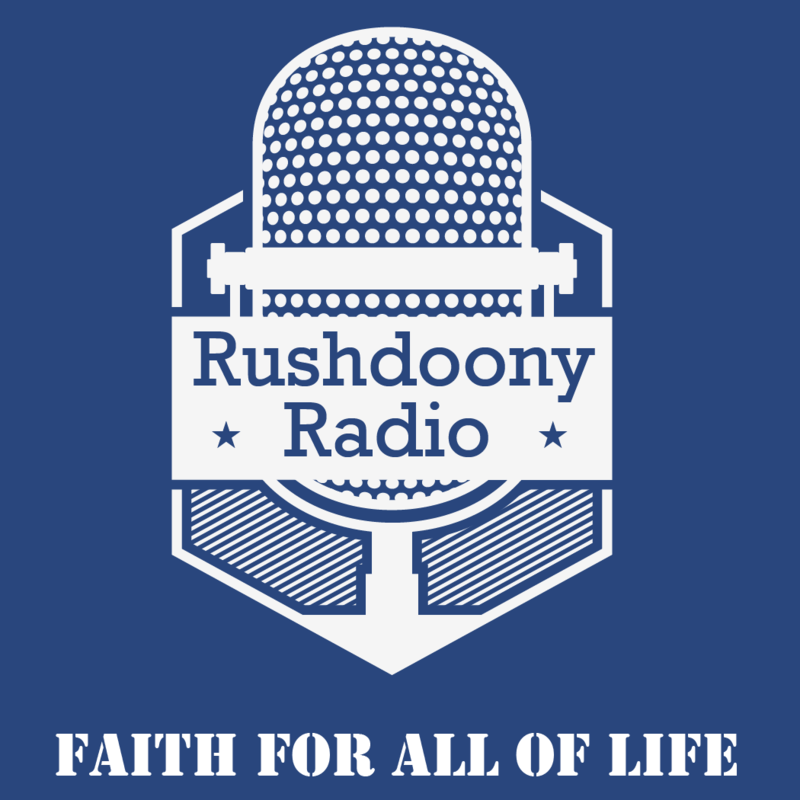 R.J. Rushdoony: 00:00 The direction of the law. R.J. Rushdoony: 00:04 Am I not an apostle? Am I not free? Have I not seen Jesus Christ our Lord? Are not he my work in the Lord? If I be not an apostle until others, yet doubtless I am to you. For the seal of mine apostleship are ye in the Lord. My answer to them that do examine me is this, have we not power to eat and to drink. Have we not power to lead about a sister, a wife, as well as other apostles and brethren of the Lord and Jesus. Are I only. Or I only and Barnabas. Have we not power to forbear working? R.J. Rushdoony: 00:48 Who goeth to warfare anytime at his own charges? Who planteth a vineyard and eateth not of the fruit there about. Or who feedeth a flock and eateth not of the milk of the flock. Say are these things as a man or sayeth not the law the same also. R.J. Rushdoony: 01:09 For it is written in the law of Moses thou shalt not muzzle the mouth of the corn that treadeth, the ox that treadeth out the corn. Does God take care for oxen. Or sayeth he it all together for our sakes? For our sakes no doubt this is written that he that plows will plow in hope and he that thrushes in hope should be partaker of his hope. R.J. Rushdoony: 01:38 If we have sought out you spiritually things is it a great thing if we shall reap your carnal things? If others be partakers of this power over you are not we rather?. Nevertheless, we have not used this power but suffer all things lest we should hinder the gospel of Christ. Do ye know that they which minister about holy things live of the things of the temple and they which wait at the altar are partakers with the altar? Even so, half the law ordains that they which preach the Gospel should live of the Gospel. R.J. Rushdoony: 02:24 We began last week a study of the mosaic law, of biblical law. As we continue our study this week, we shall deal with certain basic characteristics of biblical law. R.J. Rushdoony: 02:44 First of all, the law gives us certain basic premises, broad basic principle, the 10 commandments are such declarations. The 10 commandments are not laws among many other laws of the Bible. But they are a summation of the basic principles of the law. To understand what the law means here. Let us examine very briefly, later we shall spend a few months going into each of the laws. R.J. Rushdoony: 03:33 One of the commandments, thou shalt not steal. This we find in Exodus 20, verse 15, and in Deuteronomy 5:19. Now, as we analyze this commandment, a basic law, there are certain things that appear. R.J. Rushdoony: 03:57 As we analyze this, we find and to enumerate them under the broad heading of one basic principle, a the commandment, thou shalt not steal, establishes positively private property. And negatively, it’s declared that there are punishments for offenses against property. So we have here a basic area of life declared to be under the protection of God’s law to be a law area. Property. Property as thus of the ordination of God Himself. R.J. Rushdoony: 04:52 It is not something that man chooses and says, now I like the idea of private property therefore I’m going to have laws respecting private property. On the contrary. The law says this is of God’s ordination. Therefore the laws that govern it must be from God. Because if man himself says I establish private property, because I like the idea. Then man also or some human institution, such as the state, can also say I abolish private property because I’ve now decided I don’t like it. R.J. Rushdoony: 05:32 But biblical law says thou shalt not steal. This is God’s law. Therefore any one who tampers with private property is tampering with what God has ordained. R.J. Rushdoony: 05:53 This of course leads us to our second point. First we have seen or a that this commandment establishes an area of life with God’s ordination, private property. B the establishment of property issues not from man or the state but from God because all commandments had their origin from God to govern his ground because he is the king. And as king he declared my law has jurisdiction. I do not tolerate other law. [inaudible 00:06:38] that since God issues the law, any offense against the law is an offense against God. R.J. Rushdoony: 06:50 Now, when David committed both murder and adultery and confessed it in Psalm 51:4 he declared against the. The only have I sinned and done this evil in thy sight. In other words, first and last, the offense was against God. Indeed he had committed adultery and he killed a man. And David was fully aware of the damage he had done to human beings, but he knew that because it was law the law of God, first and last, the offense was against God. So that when a man steals, he is offending God first and last. And is offending you also, but in offending you, he is also offending primarily God. R.J. Rushdoony: 07:48 And finally D. It follows that lawlessness is God sent. Any civil or [familial 00:08:07] or [colesiastical 00:08:08] or other social action of disobedience is also a sin unless the prior law of God requires us to disobey because we have been commanded to disobey God by obeying church or state or any other institution. So that all civil disobedience is not only lawlessness, it is also of sin. Unless a prior obedience to God requires it. R.J. Rushdoony: 08:50 Now we have seen our first basic characteristic of biblical law that certain broad principles are declared and one of these that we’re dealing with very briefly today is the commandment thou shall not steal. R.J. Rushdoony: 09:16 Second, the major biblical law is case law and when we go through the law we are dealing almost entirely with case law. Now what is case law? The idea of case law comes from the Bible. We do have case law in the courts of the United States. Today the case law has become [lawless 00:09:48]. But in origin in the American legal tradition case law stems from the fact that the biblical law was the common law of the land. Now case law is illustrative of the basic principles of the law in terms of specific cases. Case law takes a minimal example and says, now this print will apply here therefore it applies anywhere above this. R.J. Rushdoony: 10:29 It does this to prevent us from misunderstandings the law. Now let us examine a case law from the Bible. First we have the basic law. Thou shalt not steal. Next a case law illustrative of this. There are hundreds of case laws with reference to theft. But here is one that we’re going to deal with. Deuteronomy 25 verse four. Thou shall not muzzle the ox when he treadeth out the corn. Now, this is an illustration. It is a case. In other words, if you had an ox and you were using it to tread out the corn, that is to thrush it. The ox is entitled to some feed [inaudible 00:11:33] grain. In other words, you are robbing the ox if you don’t feed it properly. This is what the law means. R.J. Rushdoony: 14:15 How is the commandment, “Thou shalt not steal,” illustrated? There are, as I said, hundreds of case laws. You have a right to your property that is ordained of God. This applies to your land. It applies to your possessions, and as we shall see, the right to your land includes the fact that it is immune from taxation or confiscation. Now, that’s the biblical law. We shall see later why this is so important some few months in. It also says you have a right to your labor. It is your property. You cannot defraud the ox without robbing it. You defraud it if you do not feed it properly. Your ox still has a property right established by God. R.J. Rushdoony: 21:16 Now you can see the total relativism there, can you not? It is a principle of coordination between subjective human beings. In other words, there’s no objective law. There is just a coordination, and wherewith 99 out of 100 define coordination as expropriating what you have, and they say, “Well, now you’re not coordinating … and you are the lone trouble maker. Why don’t you get with it? Why don’t you be a good boy? After all, coordination is what we want.” This is exactly what is happening today. Those of you who don’t like a property tax and who don’t like expropriation, and you don’t like the fact that people can come in and rob and rob you, and what are the policemen there for now? To protect the rioters, not you and your property. Isn’t this was the attorney general has made clear? Isn’t this what they have done? Oh, you’re not coordinating, you see, with the trend of the times. When we hold that God has ordained law, and law either comes from God and his word, or it is not law, we are saying there is an objective order, an absolute order, and it’s not what we like. We may like communism, or we may like private property, but that is totally irrelevant because the law has nothing to do with what we like or what our preference is. The law has to do with the absolute righteousness, with the justice of God, and God ordains private property. “Thou shalt not steal.” God doesn’t care whether you like it or not. He says, “This is the law.” The law and the justice of God’s law deals with the basic objective order, with a law that doesn’t change because men change. R.J. Rushdoony: 27:25 We saw Malachi, did we not? If a man robs God, and if a nation is given over to the robbery of God, what happens? I will curse their being. Curses shall be their going out and their coming in. Curses shall be the fruit of their baskets and the fruit of their bodies, and the fruit of their cattle. But if a man gives God his due, what happens? Blessed shalt thou be, and the fruit of thy body, and the fruit of thy people. Blessed shall be thy going out and thy coming in. Blessed shalt thou be from this time forth, and forever. Did you notice the expression used by Malachi? He declares that God says, “If ye obey my commandments, I will open the windows of Heaven and pour out unto you a blessing. If you’re not able to receive it would be go great. Open the windows of Heaven.” And where do we encounter that expression in the Bible? R.J. Rushdoony: 28:49 It’s the same word used in the English and in the Hebrew as in the [inaudible 00:28:55]. And God declared that the windows of heaven will open in judgment and a flood and total destruction upon the world of Noah’s day. So will be the blessing of the flood. It will be poured out upon us. R.J. Rushdoony: 29:20 Now to return to the basic law or basic promise, “Thou shall not steal. Property rights are established. Basically God’s property right over his whole creation as the [inaudible 00:29:37]. The property rights which extends as God gives us even to the earth. To the ox. The property right of man, and second the peace law. The third restitution. Restoration of God’s order as the purpose of the law. We see this illustrated in the New Testament. Remember when Zaccheus became converted? And he invited Jesus to his house, and Zaccheus stood up and he said “Everyone I have defrauded I will restore, fourfold and fivefold.” And then, when he made that statement, Jesus said ” This day salvation comes to this household.” Then did Jesus pronounce him to be saved. Restitution is referred to in the Sermon on the Mount. In Ephesians 4:28, Paul declares that those who so let them steal no more, but labor honestly with their hands. How is this understood by the early church? There was no mistake in their mind, the thief had now been ordered to restore and if he couldn’t restore to those he had robbed because they were dead and drowned and there was no one to restore to, what did he do? He gave it to the poor, that’s what Paul said. It was given in charity to the deserving poor. In terms again of the law of God. R.J. Rushdoony: 32:28 Now what was the restoration? The proclamation of the Law word of God had been absent from the land, and John the Baptist came and restored it. Second, it speaks of it as restoration or restitution by subjecting all things to Christ and establishing a Godly law order. And in Matthew 28 verses 18-20, our Lord said “Go ye therefore, all power, all authority is given unto Me, in Heaven and on earth. Go ye [inaudible 00:33:16] one, make disciples of all nations, teaching them all things that I have commanded you.” What does that mean? Bring them all under the law order. 2nd Corinthians 10:5, Revelation 11:15, the kingdoms of this world shall become the kingdoms of our Lord and of His Christ. R.J. Rushdoony: 33:47 And finally, on the Day of Pentecost, Acts 3:21, how does Saint Peter speak of the last days of the earth and the second coming. He calls them the times of restitution. The times of restitution. The restoration of God’s Law order. Now we saw last week that man was called by God in the beginning to exercise dominion over the earth and to subdue all things. This was God’s covenant with man, God’s basic commandment to man in Genesis 1:26 following. This commandment has never been revoked. And God declares and our Lord affirms it. Scripture cannot be broken. This declaration is in John 10:35. Scripture cannot be broken. R.J. Rushdoony: 35:05 Therefore, what is our function and our calling? To exercise dominion over the earth, and to subdue all things to Christ in terms of His law work. Hence the necessity of studying and of knowing the law Word of God. This should be our purpose in the months ahead. Let us pray. R.J. Rushdoony: 35:45 Our love and our God we give thanks unto Thee for this [inaudible 00:35:49] work. And we thank Thee that by this Creator exercise dominion over all things unto Thee. And having fallen away from this purpose in Adam, God has restored us to it in Christ. And commissioned us to be king, paupers and priest unto Thee. In Jesus Christ our Lord. [inaudible 00:36:17] and confirm us to this most Holy purpose and calling. By Thy Word and by Thy Spirit, and for us that we may exercise dominion in Thee and unto Thee. In Jesus name, amen.